One of my Christmas gifts this year was the book Robin by Dave Itzkoff, which is a good biography of the late comedian Robin Williams. With all Williams' many accomplishments, it is not surprising that roughly only three pages in the 500-page volume are devoted to his work as the Genie in the Disney animated feature film Aladdin (1992). While for some people that is Williams' most memorable and beloved role, most of us are familiar that he had a dispute with Disney over the film but may be a bit vague about the specifics. So, for this column, I am going to try to offer some more detail in an attempt to clarify that moment in history, especially with the forthcoming live action remake due to arrive soon as well as Disney's plans to make a film about how the Genie ended up in the lamp, a prequel to the original story. Robin Williams did not want Disney to use his name or imagery in any of the promotion of Aladdin, because he had committed to star in another film. Robin Williams found success as a stand-up comedian and received acclaim for his work as a wacky alien character in the sitcom Mork & Mindy from 1978-1982. However, film stardom alluded him and he made some bad choices on what movies to do. In addition, his first marriage collapsed and there was rumored abuse issues with drugs and alcohol. At Disney, producer Jeffrey Katzenberg felt that Williams' comic improvisation skills had potential and decided to take a chance by offering him the role of Adrian Cronauer, an Armed Forces Network disc jockey during the early days of the Vietnam War in the film Good Morning, Vietnam (1987). However, ever the good businessman, Katzenberg bargained to lower Williams' usual $2 million dollar paycheck to half that amount because of Williams' poor box-office reputation at the time. Both critics and audiences loved Williams' performance and he was nominated for a Best Actor Academy Award for his portrayal. Katzenberg immediately took advantage of Williams new popularity and cast him in Dead Poets Society (1989) that earned the actor another Best Actor Oscar nomination for his role as an inspirational teacher. Because of Katzenberg's taking a risk on Williams, the comedian's movie career sparked to life and Williams was extremely grateful. In spring of 1991, Williams was working on the Steven Spielberg film Hook (1991) when he got a call from Katzenberg asking if he could find time to come to the Disney Studios to give his input on a project that was troubled. That film was Aladdin and the original script was having difficulties structurally. Williams was busy and tired but felt he owed it to Katzenberg to drop by the studio. Katzenberg had originally wanted the film to be a swashbuckling adventure, like the classic Arabian Nights-type of movies made during the Golden Age of Hollywood. Co-directors Ron Clement and John Musker, along with composer Alan Menken, because of their success on The Little Mermaid (1989) were able to convince Katzenberg to approve a more intimate storyline. However, the script was still a mess. Aladdin had three best buddies (Babkak, Omar and Kassim) and a mother who was constantly worried about him but only appeared at the beginning and end of the film. In terms of the Genie, there were actually two genies. One lived in the lamp and the other lived in a ring and they were able to grant an infinite number of wishes. As Menken remembered, "The idea of the Genie was that he was black and had an earring. We thought he could be a hipster, a la Fats Waller or Cab Calloway. Growing up, I loved playing Fats Waller songs. That became my vocabulary." Different actors were considered to voice the role including Albert Brooks, John Candy, George Wendt, Rodney Dangerfield, Dan Aykroyd, Matt Frewer, John Goodman, Steve Martin, Eddie Murphy and Martin Short although there is no documentation that any of them were officially contacted. Katzenberg because of his previous relationship with Williams was insistent that it should be Williams. Directors Clements and Musker were also set on casting Williams as the Genie. "We were totally walking down the plank. If he said 'no', we were going to be in big trouble because the whole concept was built around Robin. We wrote the lines specifically with him in mind," Musker said. "There was nobody else who could be the Genie, and fortunately he agreed to do it. He had so much energy and so much passion." Williams had always been a big fan of the work of animation director Chuck Jones, who had done several memorable Warner Bros. cartoons and Williams considered his work inspirational. Williams would later star in Mrs. Doubtfire (1993) with Jones providing the animated sequence of Pudgy the parrot and Grunge the cat. Interestingly, one of the young animators working on the sequence was Eric Goldberg, who would animate the Genie. In addition, Williams had a good experience doing a voice of a bat in the animated feature film FernGully: The Last Rainforest (1992). The role was written for Williams and the character was originally meant to appear for eight minutes. Williams provided 14 hours worth of improvised lines so the director ended up tripling the screen time for the character in order to utilize more of that material. Williams had also "sorta" worked doing a voice for Disney animation with his participation in the Back to Neverland (1989) featurette that was made for the Magic of Animation pavilion at the Disney MGM Studios theme park to explain the process of animation. It was actually produced by Bob Rogers and his BRC Imagination Arts company as a contractor for Disney. Musker told Jerry Rees who directed that featurette that he and co-director Clements wrote the part of the Genie specifically for Williams after seeing the film. 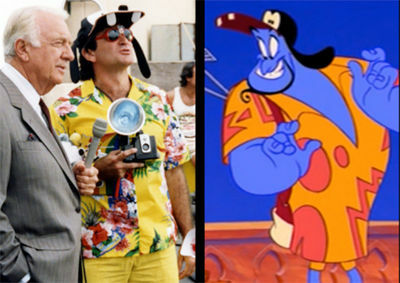 As a tribute to that featurette, at the end of the Aladdin animated feature, the Genie appears in the same yellow Hawaiian shirt and Goofy hat that Williams himself wore in the live action beginning of Back to Neverland. After Aladdin co directors Ron Clement and Jon Musker saw Robin Williams in the short Back to Neverland, they knew they wanted him as the Genie. While independent animator Bill Plympton had first been approached to animate the Genie because of his experience in doing metamorphosis in animation, he turned it down because he did not like the restrictive Disney contract. "We can see the kind of clarity and simplicity of lines that Hirschfeld gets in his shapes, even though these are very expressive forms," Goldberg said. "Another thing that Hirschfeld is great for is the strength of his poses. They are very readable from a long, long distance away. They have a great deal of elegance from one line leading organically to the next. And there are a lot of dynamics in the poses. "I was the first animator on the film. I was drafted in September 1990 and I was on pre-production for close to a year, and I designed the Genie, basically, as a swirl of smoke with a nose and eyes. He is simply a trail of smoke that came from the lamp. I always thought of him as being Jewish and Robin used a lot of Yiddish phrases when he voiced him. "John and Ron said, 'Pick a couple of sections from [Robin's] comedy albums and animate a genie to them.' That's essentially what I did. I took a part of his routine from his 1979 Reality … What a Concept album. "I cannot tell you what great joy it gave me to make Robin Williams laugh. I was such a huge fan. I think that sample is what probably sold him because Robin just laughed when he saw it. He could see the potential of what the character could be. I'm sure it wasn't the only factor, but then he signed the dotted line." At the meeting, Katzenberg then said the reason for calling Williams over was that Disney wanted him to voice the Genie. Williams was hesitant. He was finishing up the Spielberg film and he had already committed to immediately start his next live-action venture Toys (1992) that was to be directed by Barry Levinson, who had directed him in Good Morning, Vietnam, and had spent 15 years trying to get the project made. Katzenberg persisted and argued it would be great for Williams' son and daughter to be able to see their father in a Disney animated film. Williams' earlier films had ratings and subject matter that did not allow them to see those movies because they were so young. Williams agreed that he could probably arrange to attend voice sessions while he was filming. However, Williams required a few conditions so that the film would not conflict with Toys that would be released within weeks of the Disney film. Since he had agreed to do Toys first and knowing how important it was to Levinson, Williams did not want to do anything that would detract from the attention to that film especially since at that time, the Genie was basically just a small supporting role and he was the lead in Toys. 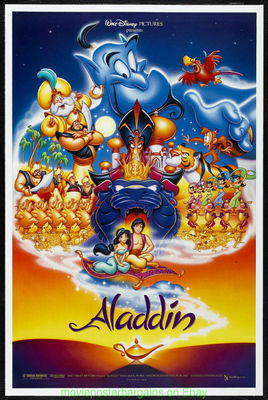 Williams did not want Disney to use his name or image in any theatrical posters, print ads, movie trailers, TV commercials or merchandise to promote Aladdin. Katzenberg eagerly agreed. However, he pointed out that because it was just a voice and a supporting role that Disney could not pay Williams his standard fee of roughly $8 million. They agreed upon Screen Actor Guild minimum that ended up being $75,000. Williams' agent, Michael Ovitz of Creative Artist Associates (CAA), objected strenuously to the deal. Williams overruled him because he wanted to make the film for his children and also because he felt that an animated feature wouldn't make that much money. The Little Mermaid was considered a "fluke" in the industry that it made as much money as it did. Beauty and the Beast and Lion King had not yet been released and Disney's 1990 feature The Rescuers Down Under had greatly under-performed at the box office. It turned out that Aladdin would gross $217 million domestically and $500 million worldwide on its first release. In addition, Williams wanted to pay back Katzenberg and Disney for earlier taking a chance on him and springboarding his movie career so he considered that he was just doing a simple favor that wouldn't take much of his time or effort to show his appreciation. While finishing work on Hook and then working on Toys, Williams would occasionally slip away for four hour recording sessions. Sometimes after a long, physically exhausting day of shooting his scenes on Hook, Williams would spend the evening at the Disney Studio rehearsing his songs with Menken and Aladdin musical director David Friedman, as well as running through new dialog with Musker and Clements. As Menken recalled, "We met at the house Robin was renting in L.A. while he was working on Hook. He arrived at our work session freshly released from spending hours as Peter Pan, suspended in a flying harness. Standing by the piano, as my musical director David Friedman plunked out the melody lines for Friend Like Me and Prince Ali, Robin gamely learned our songs, note by note and phrase by phrase. "I wish I could say I remember zany antics or a touching connection or any kind of special anecdote, but what I remember was a quiet, unassuming, thoroughly professional actor, respectfully working hard to prepare for recording our songs. "Next came our recording date at Ocean Way Studio B. John and Ron were there. We had a trio of musicians there to set down rhythm tracks for both songs, live with Robin. He dutifully sang every note and every word, making sure the phrasing, the intonation, the dramatic intention and the vocal style was all exactly as we wanted it. All the while, everyone was asking, 'OK? Alan, do you have what you need? Can we let Robin go beyond the written notes now?' The frustration was palpable. "And then, finally the time came to let Robin do his thing. No one who was there can ever forget what it was like. The burst of imagination, the endless parade of character voices, the hilarity, the sheer energy was astounding. Take after take of brilliant material poured out of him and our minds reeled from all the possibilities. After a few hours we thanked Robin profusely. And that was it. Robin was gone." "So I'm out there on the stage and Robin just cut loose for about an hour and half. That was my undoing, because I'm sitting there, trying not to laugh and kill the recordings. Finally, he takes a break and I said, 'OK, I'm going behind the glass now'. "If you think back on a lot of animation voices over history, especially from 1930s and 1940s, many were radio actors. They could express so much with their voices. What Robin had in common with them is a set of vocal chords that were 100% elastic. "We could have just gotten somebody who was technically adept at impressions but the warmth that Robin brought was something we tried very hard to convey. Sidekicks carry the comedy, yes, but you also have to believe that they care about the main character. You have to believe their sincerity. Without that, you would have a technical exercise, but no heart. "People ask me what the toughest thing about animating the Genie was, and I say, making people believe that he's sincere. That he's actually giving up something when he and Aladdin part at the end of the movie. There's no way that character would've come off the same way without Robin's warmth, absolutely no way. The human aspect that Robin brought to it really put in the stratosphere." Musker told author Dave Itzkoff, "We wrote the script with Robin and his shifting persona in mind, but with the full understanding he would add something. He performed it as we had written it, like seven or eight times, and then we'd say 'OK, wing it!' So then he'd do another eight times, each time bringing it up even more. "On that first scene, we were done after those seven or eight more takes," Musker said. "We said, ‘That's great'. He'd say 'Well, let me just try a few other things'. We wound up with 25 different takes. Each take of a two-minute scene was like 10-minutes long. And we thought, how the heck are we going to figure out what to use?" "We had a script, and if you want to call a script a road-map, then Robin took a lot of detours. And we loved the detours. Robin had so much freedom, and his ad-libbing was always encouraged. He always gave us such a huge amount to choose from. He was amazing. I can't think of a man who was more suited to the animated medium than Robin Williams. "He would do a line as written, but he would do it as 20 different characters, and John and Ron and I would take those tracks back to the studio and really put the ones in that made us laugh the most and were the ones that we thought were best suited to the lines. So even though he gave us a W.C. Fields, Groucho Marx, and a Peter Lorre on, 'No substitutions, exchanges, and refunds', we said, 'OK, the Groucho one goes here.'" For instance, when the Genie tells Aladdin to be a "straight shooter," he impersonates actor Jack Nicholson. However, Williams also did the line as other celebrities including John Wayne (as it was indicated in the script) and Dr. Ruth Westheimer (well known for her relationship advice). Even at the time of its release, many of Williams' impressions which amused adults went over the heads of kids in the audience and are even more obscure for today's generation. William F. Buckley, Arsenio Hall, Walter Brennan, Senor Wences and more are anachronistic at best, and some of the others will join that group soon. It was estimated that Williams did more than 50 different characters, both celebrities and non-celebrities, that finally appeared in the film. In USA Weekend for November 1992, Goldberg said, "My favorite is Ed Sullivan. You have Robin Williams impersonating a genie impersonating Sullivan." Next Week: Trouble in Paradise. Why Robin Williams vowed never to work for Disney ever again and what changed his mind. I can hardly wait to read Part 2!